Date of birth: Around 390 A.D.
Story: Aric grew up in a Visigoth tribe in the province of Dacia in the Southern Europe with his family. When the Romans killed his parents in 399 A.D., he went to live with his uncle Alaric where he became a warrior fighting the Romans . One evening in 408 A.D. when Aric was out on patrol, he saw a white light. On closer inspections it turned out to be spider aliens who had landed. Thinking they were Roman demons, Aric attacked immediately. The spider aliens knocked Aric unconscious and took his as a prisoner onboard one of their ships. Aric spent seven years in real time as a prisoner on the spider alien spaceship. Most of the time he was kept in stasis and in the real world it had become 1992 A.D. .
One day when he was working, he met the map giver, a human who was familiar with the entire layout of the mother ship on which they were imprisoned. He gave Aric the location on the spider alien's most powerful weapon just before Solar attacked the spider alien armada [2-5, 7]. During the commotion following the attack he retrieved the weapon, the X-O Manowar armor, which he put on, and went outside the ship. The ship he had been imprisoned in blew up and threw Aric down to Earth, where he landed in Peru . In Peru Aric was accepted into a village where he lived for a while until the spider aliens found him and killed everybody in the village. The spider aliens wanted the X-O armor back and threatened to kill more of Arics friends if he didn't give them back the ring, which controlled the armor. Instead of giving in to the spider aliens, he hunted them down and killed them [8-9]. While hunting down the spider aliens, Aric met Ken, who helped him getting to North America. Ken was actually working for the spider aliens but he couldn't go thru with getting Aric killed and helped him instead . After killing the leaders of the spider aliens, Lydia and Aristides , he transferred the control of Orb Industries, a multinational front set up by the spider aliens, to himself . Ken tried to betray Aric one more time but found that he couldn't do it. Especially after Aric gave him an artificial arm to replace the one he lost in the fight with the spider aliens, which also kept an eye on him [11-12]. During Unity, Aric wasn't really interested in the fight against Erica Pierce. Instead he collected at tribe of warriors and tried to recreate the life he used to live. He didn't succeed though. He stole an important piece if equipment from Pierce to be held for ransom. Instead of getting a ransom from Erica, she distracted Aric long enough to be able to move the X-O armor and attack him with a bionisaur. During this attack, Aric was gravely wounded and was only saved by the X-O armor holding him together [13-14]. When Aric returned to Earth, he was returned to 408 A.D. where he met his family. This didn't work out well. Superstition drove the Visigoth against Aric ending in him killing his own people. Seeing as he had nowhere to go and had to be in the armor for 10 years to be healed he buried himself and went into hibernation until 1992 . When he woke up, he was healed and the X-O armor was changed. It had become more versatile and had come to a point where it created a spore for reproduction. In a fight with the spider aliens for the right to the armor and the spore, it was revealed that the armor's name was a sentient being called Shanhara [16-19]. When the US government found out about Aric and the X-O armor, they tried to take it from him. First by threats and intimidations of both Aric and Ken, and when that didn't work, they tried to force him to surrender the armor by kidnapping Randy Cartier, his chief of security. The plan didn't work but it caused Aric to leave the X-O armor to Randy for a while [20-22]. Realizing that the X-O armor couldn't be taken from Aric and that he was too dangerous with the armor, the spider aliens created a silicon virus in order to destroy the armor. They succeded in infecting the armor and the armor Shanhara was destroyed [23-24]. Solar, who had defeated a spider alien with an X-O Manowar armor on Saturn, went back there to get a seed which was on the armor and brought it to Aric. Making an armor from the seed however required a host organism to merge with. The problem with finding a host for the seed was solved quickly. Paul Bouvier being terminally wounded by the spider aliens volunteered to be the host. It would be a way to achieve immortality and not having to watch himself turning into a vegetable from the poison which was slowly killing him. He took the seed and Pol-Bekhara was created . Contrary to Shanhara, Pol-Bekhara was influenced by Paul Bouvier. Several times Paul's personality surfased and took over the control of the armor. Ultimately Aric did succeed in getting rid of Paul's personality in the armor. This resulted in the creation of Alloy . With the destruction of Shanhara and the death of Paul Bouvier, Aric and Randy became lovers, comforting each other, but it didn't last. After the Wolfbridge affair [26-30] Randy found that is was a mistake to continue the relationship and called it off. The break-up was clearly a mistake, but they never made it back together again. Randy was kidnapped and tortured to death by Crescendo who wanted information on Aric and Orb Industries . In 1995, Aric lost Orb Industries when Crescendo wanted revenge. She destroyed Aric's company Orb Industries and in the process killed Randy and Ken [31-34]. After the destruction of Orb Industries and the death of Randy and Ken, Paul's personality resurfaced in the armor again. This time he was stronger than ever . The fight for control between the armor controlled by Paul and the control ring held by Aric resulted in the expulsion of Paul's soul and the removal of the X-O armors sentience . From here on Aric just drifted around with no real purpose. For a while he was in space fighting spider aliens and Krytos from the Dromak Empire [37-40]. When he got back to Earth he continued to drift around running into old and new foes. Here he also met the thief Gamin, who he hooked up with [41-46]. The power in the X-O Manowar armor was too much for Master Darque to resist, and he tried to take the armor from Aric. He did take the armor from Aric, but Aric found him and slit his throat while he slept, thus killing Master Darque [47-48]. After Master Darque had used the armor his psychic imprint was in the armor's core. The only way to get rid of it was by purging the armor's core. Aric did not want to do this, as it would kill the armor. Instead he tried to force the armor into obedience but it was too strong. Gamin who was too close to Aric when he tried to control the armor was killed by the armor right before Aric's eyes . Aric eventually got some resemblance of life back. He got off the streets and got a job, but he was only a pale reflection of his former self. The magician Mallik took him back to various points in his life and showed him how thing could be. Aric was given the oppotunity to relive his life, with the previous reduced to a vision of what might have been. Aric grabbed this opportunity and was back in the real world on the spider aliens ship in 1991 [50-51]. It has not been revealed if this was actually happening or just an illusion. It has been shown that Aric should die in 2062, killed by Toyo Harada, right after sending the X-O Manowar armor into space . Another story states that in 1999, Aric was transported back to 410 A.D. by Solar where he went back to his old life with his people, thus creating a split in the space/time continuum . Equipment: Aric has carried two X-O Manowar armors: Shanhara the sentient armor he took from the spider aliens who captured him and Pol-Beckhara an armor made from Paul Bouvier and a X-O Manowar seed. Pol-Beckhara was sentient for a while with Paul Bouvier's personality dominating the armor, but the sentience was ultimately lost. After the loss of sentience the armor became more mallable than before. Background notes: X-O Manowar was Valiant's best selling title and the last of the Valiant titles to fold before the introduction of Valiant Heroes - 2. 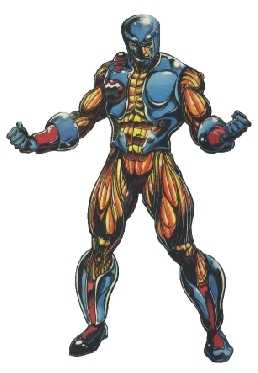 The X-O Manowar character was the only one of the Valiant Heroes - 1 characters to be used in other medias than comics. Acclaim made an Iron Man/X-O Manowar game and a two issue cross-over containing hints to the game. The game was made for PC, Playstation and Game Cube. Throughout the series, Aric was referred to as the 'barbarian in a can' in the comic book community, and there were several references to Conan in the series. Also the series was often compared to Iron Man from Marvel. Especially when Aric got a black chief of security who took over the armor for a while, was seen as a direct rip-off of Jim Rhodes in the Iron Man series.